ATLANTA and BIRMINGHAM – Luckie & Co. announces Lisa Balser is joining the agency as a group creative director. The firm also hired Denise Arnold as associate creative director. Balser arrives at Luckie with more than 20 years of experience, with recent agency assignments including freelance and contract work at Moxie, Huge, GTB, and DigitasLBi, developing campaigns for international accounts including Ford, Delta, UPS and Coca-Cola. She has a passion for non-profits and also worked with American Cancer Society, The Center for Civil and Human Rights, The Eating Disorders Information Network (EDIN), and Usher’s New Look. Previously she was creative director/copywriter with the Atlanta office of Fitzgerald & Co., where she helped launch their Diversity and Inclusion program, and associate creative director with Ogilvy & Mather. Balser is a Certified Diversity Executive (CDE), working with clients, agencies and schools to develop programming and policies designed to further more diverse and inclusive cultures within organizations. Balser is also an instructor, advisor and diversity consultant with The Creative Circus and serves as lead of the Atlanta Chapter of SheSays, an award-winning global organization focused on the engagement, education and advancement of women in creative industries. Balser resides in Sandy Springs. Arnold arrives at Luckie with more than 17 years of experience with both digital and traditional agencies. Prior to joining Luckie, Arnold held positions with Digitas, Moxie, JWT and Ogilvy, and she gained a passion for healthcare through personal experience and work with clients Piedmont Hospital, Children’s Healthcare of Atlanta, Astrazeneca and Brookdale Senior Living as well as brand experience with Delta Air Lines, Nike and the U.S. Virgin Islands. Arnold resides in Peachtree Corners, Ga. Privately owned and fiercely independent for 65 years, Luckie & Co. is a marketing firm that uses data and consumer insights to solve its clients’ toughest challenges. With offices in Atlanta and Birmingham, the firm operates on a core belief that innovation and meaningful change come from a solid marriage of data science and creativity. Luckie’s client roster includes top brands in healthcare, tourism, and CPG, including: GlaxoSmithKline, Regions Bank, Piedmont Hospital, Visit Panama City Beach, Little Debbie, Express Oil Change, Alabama Power, Alabama Tourism Department and Williamsburg, Va. Learn more at Luckie.com. A member of the team at Luckie & Co. received a prestigious industry award for his work in videography last week. John Hunter, a senior editor and director of photography in the agency’s Birmingham office, earned one of the annual Ten Awards presented by the American Advertising Federation (AAF) of Birmingham. 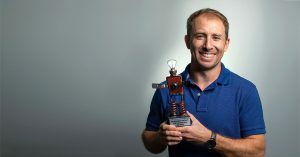 Hunter was given the Production Award in recognition of craftsmanship and creative excellence in bringing “the brilliant and sometimes grandiose-ideas of creative teams” to life. Hunter has been with Luckie & Co. for 10 years and prior to joining the firm was in freelance film production. As director of photography, he manages in-house production and video editing across all media channels for Luckie. His work touches a wide range of clients including the U.S. Civil Rights Trail, Little Debbie, Williamsburg Tourism, and several projects on behalf of Regions Bank. Hunter received the honors at a ceremony in Birmingham’s Vulcan Park on June 28. He is a resident of Vestavia Hills. 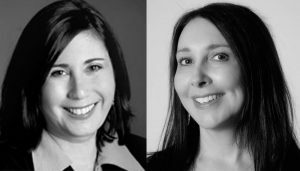 Luckie & Co.announced two additions to the agency’s Atlanta-based team. 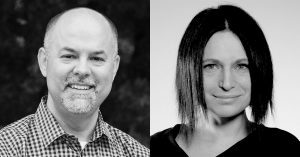 Maria Goodall joins as Creative Director while Brian Lamkin joins as Vice President of Business Intelligence and Analytics Solutions. Goodall joins Luckie & Co. from Moxie, where she most recently served as associate creative director. With two decades of marketing and advertising experience, she has developed integrated, multi-channel campaign for international consumer brands such as Verizon, L’Oréal, Coca-Cola, UPS and Wells Fargo. As Luckie’s creative director, Goodall will work with a team of art directors, writers and designers in the Atlanta and Birmingham offices. Goodall’s alma maters include Moscow Architectural Institute, Israel Institute of Technology and Massachusetts College of Art. Brian Lamkin joins Luckie & Co. to manage business intelligence and analytics solutions for the agency. Throughout his 23 year career Lamkin has held a variety of IT, data warehousing, sales analytics, and marketing analytics positions at Cash America International, Galderma Laboratories (a division of Nestle Skin Health), and Smith & Nephew. Brian has an extensive background in database management, BI platform implementation, team leadership, and predictive analytics. Contributing to both Luckie offices, Lamkin is based in the Dallas-Ft. Worth area. Still hungry for more Luckie brain food? Be sure to check out our website at luckie.com. And if you still want more, then, well, it might be time to admit you have a problem.